Went up with Trapper Steve. He drove. Cold and clear. Good long range vision for once today. Could really see the lay of the land. Best weather so far this year. Went direct to Cliff Site 1. 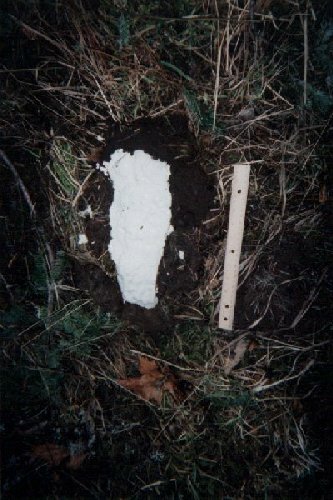 The imprint was still clear after two weeks under the snow. From my previous trips, we know the imprint had been made between Thursday and Saturday, two weeks before. Went out into big meadow, lots of standing water. Trapper S. mixed up some plaster-of-paris in a plastic zip bag. Went back and poured imprint. Waited, nothing. Too cold. Walked around. Explored area around meadow. I went into the brush to the east, he to the west. Plaster still liquid, too cold. Took off toward the old rotten bridge that Cliff had showed me. The one on the road with the rock circle behind the fallen tree. Snow turned us back. Parked and walked through the brush up a south facing slope to a rock scree. Cliff had been talking about a big one in the area. This one was kind of small. The reason Cliff wanted to find the right big one, was that when he used to live here, there were big animal trails on each side of it. He figured that if we watched the trails we might find some prints. Went up west on Mt. 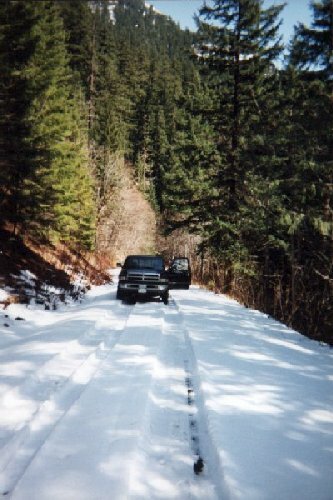 Mitchell flats access road. Snow turned us back. Guy that works at Job Corps camp down by Ripplebrook came bashing up through the snow in his little 4 x 4 pickup. He found a spot in the sun, hauled out a chair and opened a short case of beer. He got out a book and sat back. When we walked back down by him, he told us it was his day off. We asked him if he ever saw anything unusual up here. No reference to BF. Caught on quick to what we were looking for. He said, "No, but had heard some stuff." He said to call the cultural person at the Forest Service in Estacada. He thought the person could give some good information. 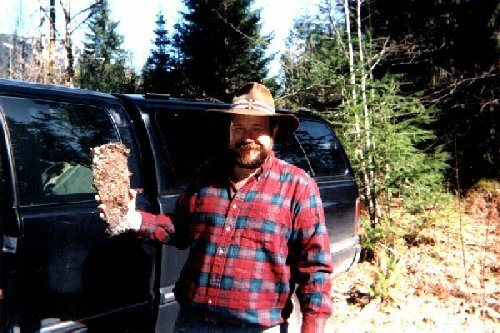 Said that he used to work out of the ranger station at Ripplebrook before the environmentalists essentially stopped logging in the national forest. Then he was done talking. He had helped and now he wanted to enjoy his day off. 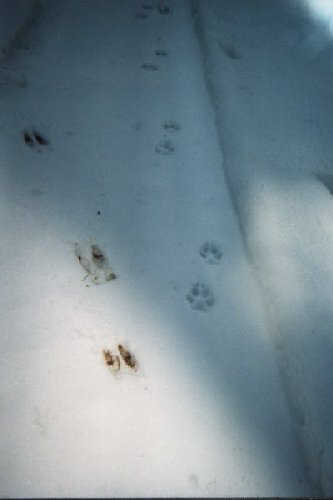 We found coyote, deer and grouse tracks in the snow up there. Didn't get near where Cliff and I had stopped earlier in the winter. We went back and the plaster had dried enough to pull it. Didn't pick up the toes very well. Was still good and damp, so pulled up a lot of grass and dirt. The cast was about 14" plus when we actually measured it. Didn't walk much today. The exercise part of the outing was only about ½ of what we normally do. It had been a good outing and the weather had been excellent. A note on the cast. While it was interesting and the photos show a nice imprint, we were not too impressed with the cast as evidence of a large bare foot, partly because the toes didn't pull too well. However, the cast has some unusual characteristics. Months later, Thom Powell of the BFRO showed us some casts he had gotten from Frank Kanester over in Colton. Those casts had apparently come out of the upper Molalla River drainage. That area is just west of the Clackamas River drainage, or about 25 air miles away from where we cast the imprint. One of Thom's casts was remarkably similar in size and odd characteristics to the one we cast near Ripplebrook.